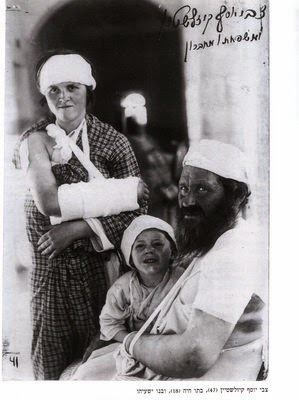 I was walking with Arieh Kiselstein whose father (pictured here with his injured father and sister) was 4 years old when rescued from under a heap of slain Jewish bodies. At the time of the Chevron massacre, there was only one British policeman in charge of the whole town. Fortunately this time our own police responded quickly enough to prevent many more deaths. In 1929 the Arabs offered Chevron's Sephardi community leader Rabbi Slonim a deal: hand over the local yeshiva boys and we will let your families live. The rabbi refused and was shot dead. In the end 55 of the 67 killed were yeshiva boys. In an hour or so I will be setting out to Chevron to enjoy Shabbat Chayei Sarah at the Cave of Machpela which was bought by Avraham Avinu 3,800 years ago. Each time I go, more and more crowds flock to this unique celebration of Jewish history and heritage. Most welcome are the teenagers, many of whom come from secular homes with no experience of a real Shabbat. The story of our people’s recovery of Machpela after 700 years was best told by the late Rabbi Shlomo Goren, Chief Rabbi of the Israel Defence Forces during the 1967 war. Fresh from the liberation of Jerusalem and the Western Wall, he wanted to be among the first Jews to return to the ancient city of the patriarchs. Holding the rank of general, he joined the armed forces stationed at the recently captured Etzion Bloc, on their way to Hebron. On the evening of 28 Iyar, before retiring for the night, he asked to be wakened when the soldiers began their march into Hebron the following day. The next morning he awoke, only to find himself alone with his driver. Realizing that he had been left behind, he ordered his driver to begin the 20-minute journey into Hebron, expecting to meet the rest of the army enroute. Rabbi Goren thought it peculiar that he hadn’t encountered any Israeli soldiers on the road and assumed that they had already secured the city in record time. Driving into Hebron, he was greeted by the sight of white sheets fluttering from the windows and rooftops of Arab homes. The Rabbi theorised that this must be fear of retaliation for their 1929 pogrom in which 67 Jews were massacred and many more wounded. Leaving his driver and clutching a Torah scroll, Rabbi Goren quickly made his way toward the Herodian walls which now surround Machpela; the Tomb of the Patriarchs. Once inside he blew the Shofar, just as he had done 24-hours earlier at the Western Wall. Only afterwards did he discover that when he left the Etzion base, the rest of the forces were on the other side of the hill, making plans for the attack on Hebron. The army was astonished to find that their Chief Rabbi had single-handedly conquered a city of 80,000 Arabs. Jews had finally returned to Hebron and the sacred burial place of their patriarchs! As genuinely holy to Muslim descendants of Abraham as it is to us, Machpela is a modern-day mosque. But for decades it has been shared with Jews for visits and prayer. By agreement Shabbat Chayei Sarah is one of the special days of the year when all sections are opened to Jewish pilgrims. What a shining example of what could be achieved for the Temple Mount with peaceful intent instead of murderous incitement. Next year, why not join us? Give our people guns ! Now that we can clearly see the Third Intifada blowing in from all directions, with full and active incitement ascribed to Abbas and his business-suited PLO, it’s time to allow Israelis to protect themselves better. Despite the common sight of guns carried openly by off-duty soldiers and security volunteers, gun licensing for ordinary civilians is strictly controlled in Israel. But in just the last 48 hours it’s become clear that every Israeli in any location is a legitimate target, with the highest risk of attack being on motor vehicles especially travelling at night. It’s absurd that in today's peaceful America the right of private citizens to bear arms is sacrosanct whilst in Israel, already walled-in against terrorists, private firearm licenses are so strictly rationed. Of course there have to be background checks and mental-health restrictions just as in the US and other countries. But the status of Israeli citizens above almost all others is that they already have a responsible and disciplined attitude to firearms by dint of their mandatory army service and training. I doubt if any adult using Israel’s roads in the current inflamed situation would not feel a lot safer with a handgun in their glove-box. 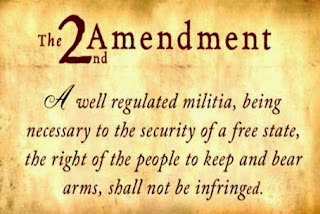 The government should allow all citizens this security and the ability to protect themselves from attack or hijacking. We trust our citizens as soldiers and we must trust them equally in civilian life. 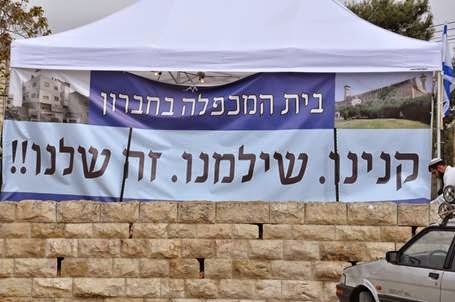 And the biggest funder of terror in Jerusalem is …..
Set aside for a moment the security scandal that this week’s shooter of Rabbi Yehuda Glick at the Begin Heritage Centre actually worked in its own restaurant. But how did this Mutaz Hijazi get a job in any city establishment after emerging from an 11-year jail term vowing more violence against Jews? To be officially employed in Jerusalem, this animal needed all the relevant entry and work permits and would have been eligible for social security for himself and his family, including healthcare as any other city resident and taxpayer. 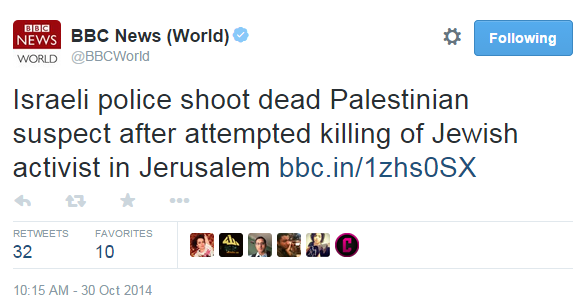 Think of all those Arabs who’ve been running riot in Jerusalem over these 9 months of government inaction. The one who rammed the tractor into a bus or the one who killed the little baby last week. The ones who attack yeshiva boys or the gang that blew up the petrol station. Or any of the mobs who have repeatedly attacked and vandalized the new light railway system. They all go home to families who praise them to the skies even as they fill-in more application forms for state and city welfare entitlements, pensions and healthcare. This turns out to be the same lunacy as Gaza, where we pipe-in electricity even as they rocket our power stations in Ashkelon. In this way, the City and State are funding the terror and civil disobedience of East Jerusalem Arabs on a daily basis, and far more than any external sources of terror investment. In the past, terrorists like these used to have their houses demolished. When that made for bad headlines it mostly stopped. Now it’s time to hit these terror families in their pockets. All security prisoners coming out of jail should be placed on permanent probation, reporting to parole officers. If they continue to associate with Jihadi groups plotting attacks on the Jewish state, they should be denied the documents and privileges of the State in terms of employment and welfare. If their families lionize these martyrs and vow to give birth to more of them, they too should have their permits, benefits and entitlements put under review. If after curtailment of their goodies such PLO families fail to make ends meet, maybe they will move somewhere else and good riddance to them. The loons on the European Court of Human Rights continue to prevent EU countries from deporting killers and rapists on the grounds they are ‘entitled to a family life’. Let us not be so stupid as to fund and entitle terrorist families like the Hijazis to a normal family life when they praise those who seek to destroy ours.